NSAIDs Pharmacology | All the Facts in One Place! NSAIDs are non-steroidal anti-inflammatory drugs – medicines predominantly used in the treatment of pain, fever and inflammation. Though NSAIDs are effective at treating these specified indications, they are also linked to a wide array of serious side effects and manifold drug interactions – many of which we explore below. First though, let’s quickly review what NSAIDs are used to treat before going on to learn how NSAIDs achieve their desired therapeutic impact. Mild-to-moderate pain – which may present as dental pain, headache, low back pain, menstrual pain and postoperative pain etc. Inflammatory-related pain – conditions such as rheumatoid arthritis, inflammatory arthropathies, osteoarthritis and acute gout. There are also other medicines – such as etoricoxib – which are licensed in the EU but not in the United States. Other drugs, such as rofecoxib, have been withdrawn wholesale from both the EU and US due to a substantial increased risk in serious cardiovascular events, such as myocardial infarction and stroke. Let’s take a few minutes to review NSAIDs pharmacology – how they work to induce their therapeutic impact. COX-1 enzyme – a “constitutively expressed” enzyme that stimulates prostaglandins necessary to protect the gastric mucosa. The COX-1 isoform is also responsible for maintaining renal perfusion by dilating arterioles. It also inhibits thrombus formation at the vascular endothelium. COX-2 enzyme – an “inducible isoform” that stimulates prostaglandin synthesis that contributes toward pain and inflammation. Inhibition of the COX-1 enzyme is responsible for most adverse effects, particularly gastrointestinal adverse effects – such as an increased risk of bleeding – and renal and cardiovascular adverse effects too. Therapeutic benefits of NSAIDs come about principally through inhibition of the COX-2 enzyme – though there is some degree of overlap between the two isoforms. Most NSAIDs act through non-selective reversible inhibition of both enzyme isoforms. Aspirin is an exception though – as it acts through irreversible inhibition. How does COX produce pain and inflammation? As an enzyme, COX catalyses the formation of pro-inflammatory mediators – such as prostaglandins and thromboxanes – from arachidonic acid; a mechanism first expounded by the English pharmacologist, Sir John Vane (who, incidentally, was co-awarded the Nobel Prize in Physiology of Medicine in 1982). Of course, NSAIDs pharmacology doesn’t stop there. After all, NSAIDs are used to treat more than inflammation; they’re also used to treat pain and fever too. Pyrexia is caused by an accumulation of prostaglandin E2 – a hormone-like substance that influences thermoregulation in the hypothalamus. By inhibiting the COX enzyme, NSAIDs reduce prostaglandin synthesis within the hypothalamus and, as a result, reduce fever. NSAIDs inhibit phagocytosis of urate crystals – helping explain why they are effective in the treatment of pain caused by acute gout. NSAIDs are associated with their own range of side effects – some minor, many serious. Gastrointestinal effects – dyspepsia, nausea, diarrhea and gastric bleeding and ulceration – risk of serious effects increases in patients with inflammatory bowel disease. Taking oral NSAIDs with food can minimize these risks. Cardiovascular effects – increased risk of heart attack, stroke and heart failure – particularly in patients with a history of cardiovascular disease. Aspirin is not associated with these risks. Renal effects – because NSAIDs reduce glomerular perfusion, they increase the risk of kidney disease in the long-term. NSAIDs are also linked to salt-water retention which, as a result, can lead to hypertension. Hypersensitivity effects – NSAIDs are associated with allergic reactions. For example – worsening bronchospasm in asthmatic patients, development of wheals or other skin eruptions, and photosensitivity reactions. This summary of potential side effects is by no means exhaustive, but it highlights the many serious clinical implications that come with NSAID use – many implications we explore below. That NSAIDs should be avoided in patients with kidney failure, liver failure, heart failure and in patients with a known history of NSAID hypersensitivity. That the most optimum NSAID and dose should be used. For example – patients with pre-existing peptic ulcer disease may need to be prescribed an NSAID, even though NSAIDs are associated with an increased risk of bleeding and ulceration. Some drugs – such as ibuprofen – are associated with the lowest risk, whereas other drugs – such as indomethacin and piroxicam – are associated with the highest risk. Due consideration should be taken to select the right medicine. That due to reduced blood flow through the kidneys, NSAIDs reduce the efficacy of drugs such as diuretics while decreasing the elimination of other drugs, such as methotrexate. That certain drugs – such as anticoagulants and SSRIs – when taken with NSAIDs increase the risk of gastrointestinal bleeding. Similarly, NSAIDs increase the risk of bleeding when taken with warfarin. Aspirin should not be taken by children under the age of 16 as it can precipitate the potentially fatal Reye syndrome. Gastroprotection should be considered to attenuate the risk of GI side effects. For example – patients taking low-dose aspirin are at an increased risk of GI effects. Taking a proton-pump inhibitor – such as omeprazole – can eliminate this risk. Patients taking corticosteroids – such as prednisolone – are also at an increased risk of developing gastrointestinal adverse effects. Though these clinical considerations are not exhaustive, they demonstrate how careful clinician’s must be when prescribing NSAIDs. Due to their impact on the gastrointestinal, cardiovascular and renal systems, there are omnipresent clinical factors to consider. Nonetheless, when accurately prescribed, NSAIDs remain an invaluable drug class in the clinician’s toolkit. 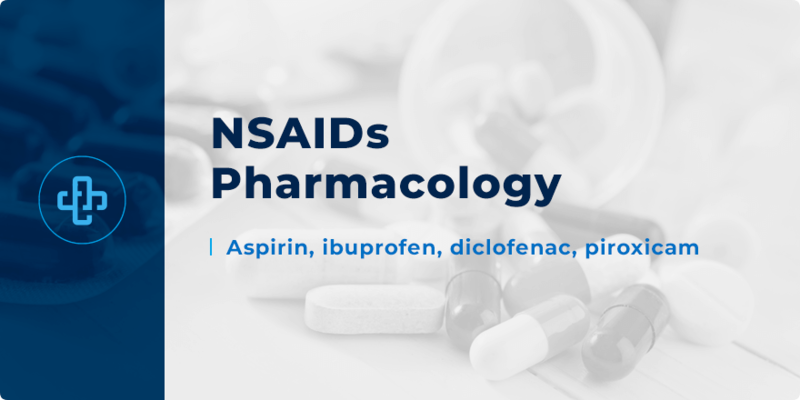 Want to learn more about NSAIDs pharmacology? Register with PharmaFactz today to receive instant access to all the resources you need – tutorials, quizzes and more. In the meantime, join our newsletter (above) to receive all the latest facts direct to your email.